The N.C. Senate’s $22.9 billion budget plan may be rolling swiftly through the chamber this week. But public education advocates—given just hours to review the massive budget document after it was posted online early Wednesday—say the Senate’s GOP leadership is shortchanging teachers and students with their latest spending package. The criticism for state lawmakers mounted Wednesday as K-12 leaders processed the massive bill, just hours after Senate Republican leaders touted a $600 million increase in public school funding that includes pay raises for teachers and school administrators. Much of the criticism centered around Senate Republicans’ move to incorporate plans for a $1 billion tax cut, which critics say will primarily benefit the wealthy and corporations. Republicans, however, say they’re returning money to taxpayers after recent government surpluses. “We understand that some want to spend more than this budget spends,” Senate President Pro Tempore Phil Berger, a powerful Republican representing Guilford and Rockingham counties, said Tuesday. However, progressives and Democrats say the lost revenue is sorely needed across state agencies, and particularly in North Carolina’s public schools. Senate leaders say they hope to wrap negotiations in their chamber by the end of the week, with state House lawmakers offering up their own draft—which is expected to be somewhat friendlier to schools—in the coming weeks. Republican lawmakers say they want to have a finished budget on Democratic Gov. Roy Cooper’s desk by mid-June. 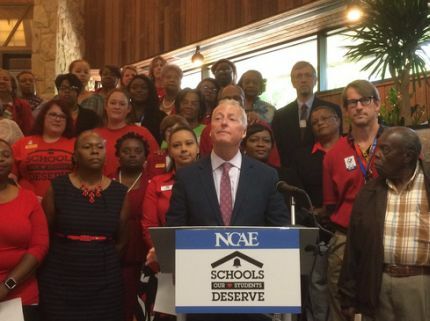 The Senate budget coincides with new national rankings from the nonpartisan National Education Association (NEA) that show the state made some progress on teacher pay, rising from 41st last year to a projected 35th this year. However, news that the state’s per-pupil expenditures on public schools had actually declined, dropping from a lowly 42nd last year to 43rd in 2017-2018, seemed to galvanize education advocates as Senate budget wrangling began in earnest. 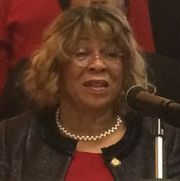 Jewell called on lawmakers to raise the state’s per-pupil spending, pegged at an estimated $8,940 in the coming year, at least to the national average of just less than $12,000. Wednesday morning began quietly enough, with a strangely skeletal K-12 appropriations committee that included little to no discussion of the Senate GOP’s budget package. That may be because Senate Democrats were largely absent from the committee meeting. Nevertheless, Republican lawmakers were questioned in the chamber’s full appropriations committee later in the morning, with some slamming a much-touted teacher pay overhaul that fell short of Gov. Cooper’s budget proposal in March. Democrats also pointed out the pay scale seemed to slight newer and more experienced teachers, bundling some of its largest gains for teachers in the mid-ranges of experience. That news, coupled with Republican proposals to scrap retiree health benefits and pensions for new teachers, skip cost-of-living adjustments for state employees and bypass written commitments for additional funding of “specialty” arts and P.E. teachers in elementary grades, will only exacerbate the state’s well-documented troubles with teacher recruitment, critics say. Debate over arts and P.E. funding comes after a Senate budget mandate to shrink K-3 class sizes beginning in 2017-2018 emerged as a major point of contention in the early weeks of the session. Republicans say local school districts are misusing their funding allotments. School leaders counter that, without additional specialty cash or local flexibility over class sizes, districts will be forced to lay off thousands of arts and P.E. teachers to clear funding space for new core subject teachers in K-3. Last month, Senate Republicans passed a one-year stay on the stiffest requirements of that mandate while promising to revisit specialty funding next year. However, GOP lawmakers this week again resisted efforts to make any legislative promises in the budget, although they talked of using state data gathered this year to take up the issue next year. Textbooks and classroom supplies, meanwhile, figure to be another major point of debate as state lawmakers finesse budget plans in the coming weeks. This week’s Senate proposal allots an additional $10 million in each year of the biennial budget in recurring funds, on top of an additional $1.1 million in non-recurring cash. But it’s worth noting that the proposal simply restores a $10 million cut made in previous years by GOP lawmakers. NCAE leaders castigated Republican lawmakers on the matter this week, pointing out textbook funding levels still fall short of pre-recession levels. It was a point hammered home in a statement from Senate Democratic Leader Dan Blue Wednesday morning. 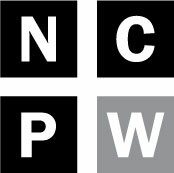 This week’s budget plan also hands down a whopping $50 million in cuts over two years to central office administration and operations in the Department of Public Instruction, despite claims from the state’s top public school agency that past legislative cuts have severely hampered the department’s ability to provide intervention and guidance in North Carolina’s poorest and most low-performing districts. 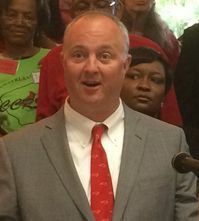 The Senate plan would also dish out cuts to the State Board of Education, a panel of gubernatorial appointees charged with overseeing and administering the state’s public schools, eliminating multiple staff positions that report to the board, including two positions directed at negotiating legislative affairs with the General Assembly. The cuts come with the state board, Superintendent of Public Instruction Mark Johnson and the legislature set for a June court date over lawmakers’ December vote to shuttle greater powers to the new Republican superintendent. Also of note, the budget includes funding for up to five new positions reporting solely to Johnson and allocates another $300,000 for Johnson to use in his legal affairs. School advocates may also take note of a proposal to ax state funding for the Governor’s School of North Carolina, a popular summer program for gifted high school students. During committee meetings later Wednesday, budget leaders agreed to retain state funding for the program in 2017-2018 at least, with plans to create their own version of the program in the follow year. The budget’s also likely to spur criticism for one thing it doesn’t do: namely, back off on plans for a $100 million expansion of the state’s private school voucher program in the next decade. It’s a plan spurned by public school supporters who say taxpayer dollars are being diverted to mostly religious schools with weak accountability and non-discrimination measures in place, pointing to reports of LGBTQ discrimination in some private schools. It also incorporates Senate calls to create education savings accounts, a controversial favorite of school choice backers that would, according to one Senate proposal, allow parents of children with disabilities to use state funds on private school tuition. Despite the controversies baked into the budget, Berger argued Tuesday that the chamber’s appropriations chiefs had invested “generously” in the state’s public schools. Berger added Senate Republicans and Gov. Cooper share similar priorities when it comes to education spending. “The difference is simply different spending levels,” he said. But Democrats and public school advocates alike complained the latest national rankings are a better reflection of Republican priorities when it comes to public education.